Students worked in small groups for the majority of the unit and since we only worked on the project 1-2 days a week, the project lasted approximately 2 months. If I had the opportunity to work on this daily with my class, it would have been approximately a 2-3 week unit. As a middle school teacher, I would also use this unit in my grade 6 classroom. You can view the preview of the unit here. We started the unit with some brainstorming and research about the design aspects of sneakers. 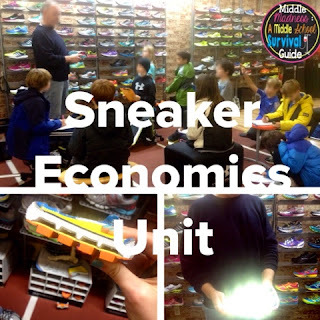 We compared the aspects of different athletic shoes (wrestling, soccer, football, running, dance) and running shoes for different purposes (trail, racing, hiking). I provided suggested sites for them to review the given topics, but some of the students really enjoyed finding their own sites and sharing it over our class Edmodo page. The students then picked two different athletic shoes to research and compare the qualities of (structure, function, materials, colors, stability, flexibility, soles, etc) each shoe. They completed a graphic organizer and gave a brief 1-2 minute presentation to the class. A quick side note about presentations: They love opportunities to do present information even when it is a brief 1 minute of speaking. I think it has been one of the things that has really helped their confidence with speaking in class and has helped them to focus on their public speaking rather than relying on a power point/prezi/etc. While students present, each "audience member" writes what they thought was the person's presentation strength (voice, pacing, eye contact, emphasis, etc) and as an exit ticket we go around and share the strengths of each person before we leave for the day. We then researched and debated the concept of barefoot running. 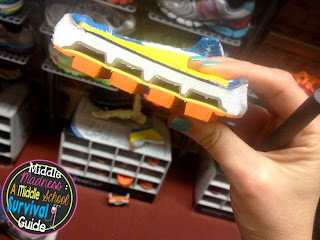 The students has a high interest in the new minimalist running shoes that are based on this concept and there are many interesting articles that fueled our debate. I recommend using this with my Fishbowl Forum Freebie. or debate with whichever debate format works best in your classroom. 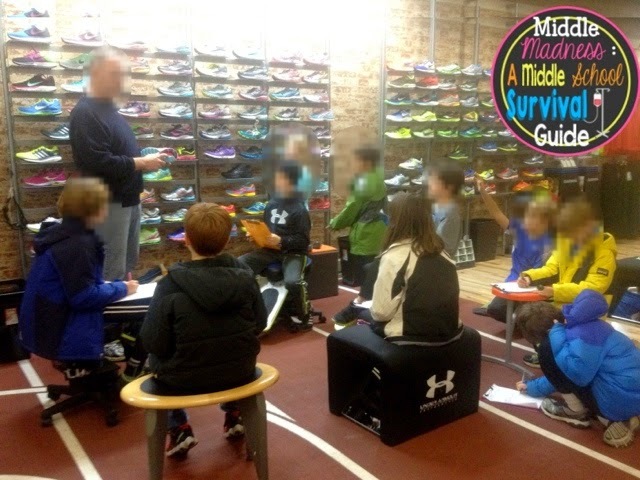 MY favorite part of this unit was our field trip to a local running store. I arranged the trip with the store and parents signed the permission forms digitally using www.123ContactForm.com. (highly recommended!) Since we went after about a week of researching, the students were prepared with excellent questions. We went prepared with the worksheet from my TpT packet and clipboards and pens for recording notes on products and new technology. 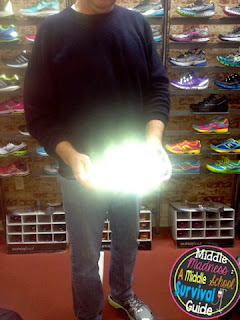 Here is a cross-view of a sneaker we were able to view at the store. Originally, I had planned to cut apart an old sneaker to view the inside. However, since the store had this available, I did not end up including cutting up the sneaker in the unit. This was the students' favorite picture from the store. They couldn't stop talking about how the materials "glowed" and became very interested in technology and parts of the student to include reflective materials on. From here I created 10 pages of worksheets to walk students through making decisions about their sneakers. (color, cost, materials, marketing, financial backing, etc.) The students had a lot of fun with this section. The students finished the unit with a power point or prezi presentation to share information to an audience of "sharks" (think the show "Shark Tank"). of the pages are printables for the students to work on. Overall this was a fun cross-curricular unit with application to science (principles of design based around the science of the foot and running), real-world math application (marketing and finances portion of the shoes development), and language arts application (informal presentation, debate, and a formal presentation). Since I loop with students, I will not be able to use this unit again until next year....but I can't wait until then!